The senator from Ohio is the real deal. And that made his convention criticism of Donald Trump exceptionally authentic and effective. 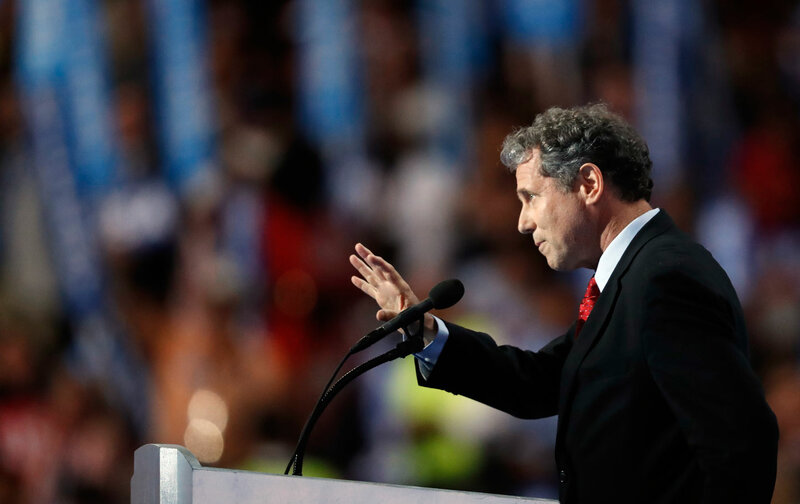 Philadelphia—Ripping Donald Trump’s “counterfeit campaign,” Ohio Senator Sherrod Brown used a speech on the last night of the Democratic National Committee to provide a lesson on how to demolish Donald Trump’s claim to be a champion of American workers. The Republican presidential nominee has always been a false prophet of populism—a fact confirmed beyond debate by the New York billionaire’s selection of Indiana Governor Mike Pence, an anti-union zealot who has supported free-trade pacts that devastate working families and the communities where they live, as his running mate. But Brown explains that, even before the selection of Pence, it was easy to identify Trump as a scam artist when it comes to trade policy. “I’ve been fighting for a trade agenda for more than 20 years that puts American workers first. And I can tell you, in all those years, I’ve never even seen Donald Trump. No—the only thing I’ve seen Donald Trump do when it comes to US trade policy is run his mouth and line his pockets,” Brown told the convention shortly before Hillary Clinton accepted the party’s presidential nomination. Speakers on the closing night of a nominating convention always deliver their remarks in the shadow of the nominee. But Democrats who are looking to develop necessary strategies for winning battleground states such as Ohio and Pennsylvania (where Clinton is traveling on a post-convention bus tour) should reflect on the arguments Brown made—as he zeroed in on Trump’s true vulnerabilities in a way that only a true economic populist can. And Brown put those arguments to work for Democratic presidential nominee Hillary Clinton, who will need to pick up on those populist themes as she pursues a fall campaign in states that have been hard hit by failed trade policies and the anti-union agendas of most Republicans and some Democrats. Clinton reportedly considered Brown as a potential vice presidential running mate. She did not choose him. But on Thursday night the senator from Ohio delivered a speech that illustrated why he was on the short list. Many Democratic delegates at the 2016 convention expressed skepticism about Clinton’s recent pronouncements regarding the Trans-Pacific Partnership trade deal—which she once described as a potential “gold standard” agreement but now opposes. With Brown, there is no call for skepticism or frustration. For a quarter-century, he has worked with unions, environmental groups, human-rights organizations, and democracy advocates to counter the free-trade agenda of multinational corporations and Wall Street speculators. Clinton considered Brown as a vice-presidential running mate. It is easy to see why. Indeed, there is a good case to be made that Brown is the steadiest and most effective critic of the TPP in Congress. As such, he brings absolute clarity to debates about trade policy, worker rights and income inequality. Brown’s criticism of Trump is powerful, and his support of Clinton is meaningful—as it helps to validate her candidacy with voters who are angry with a rigged economic system. But the Ohioan’s fury was focused on Trump. Brown delivered a heartfelt, and masterful, rebuke to a “billionaire populist” who will always err on the side of billionairism rather than populism. For those who suggest that another billionaire speaker, former New York mayor Michael Bloomberg, was the most effective critic of Donald Trump to address the convention, I beg to differ. I’m with the guy who wears those suits made by Workers United union members in Brooklyn, Ohio, at a factory that—though he was too modest to mention it—Brown fought for years to keep open. Sherrod Brown is the real deal. And that makes him an exceptionally authentic and effective critic of Donald Trump.